FAST FREE SHIPPING! Ships within 1 business day. 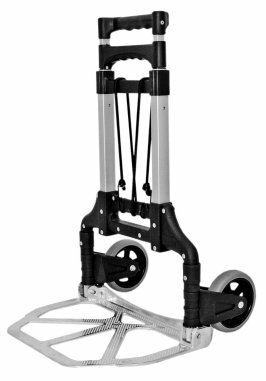 The Smart Cart has three vertical handle positions and comes standard with a bungee cord. The wheels and baseplate fold flat for easy storage. • Space saving folding design. 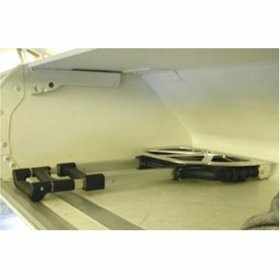 Fits into small storage spaces or car trunks. • Elastic straps for securing load. • Fits into overhead airline compartments. • Non-marking shock absorbing rubber tread wheels. Excellent cart for hauling heavy plants, 50 lbs of corn or bird seed. Highly recommend. This is well made. Perfect for putting tool bag or material on . 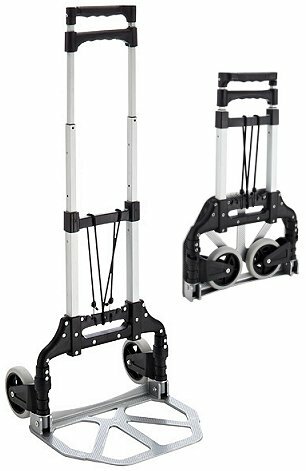 Had used a similar product in the past, however this little hand truck works great when hauling a carton or 2 of envelopes from the vehicle into a business. Whenever the weight exceeds 50 pounds of paper products, I use this hand truck to load and unload the product. Great Little Tool!! 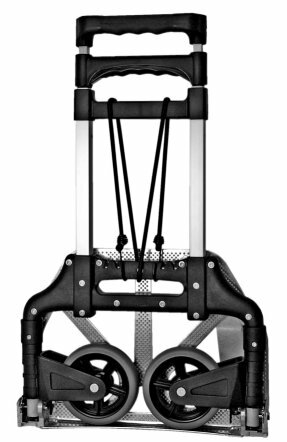 Your hand truck it just what I needed. I had a quadruple heart bypass a few years that prevented me from lifting heavy objectsas a General Contractor and Real Estate Broker, I do have to transport items most days the light weight, ability to fold and low cost appears you designed this excellent product for me it has everything but my name on it can you tell I like it??????????? 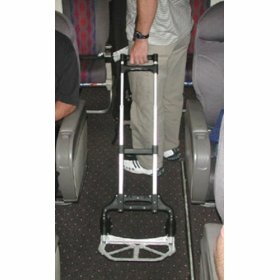 Folds into small, flat, easy to store cart. Helps me carry my 22 lb portable scale 3' x 4' approximately from the car to the house. My back is so much happier since I purchased this cart. Bought another one for my son in law, who travels to South America frequently, and has to tote large items around the airport, etc. Backsaver, lifesaver, do yourselves a favor buy this piece. Primary reason for purchase was to move large bags 450 lbs of dog food. The cart works very well. The wheels make it easy to roll and lift up stairs. After use it folds very slim and can be tucked in beside a fridge,washing machine or work table. This handtrck is very good! Thank you! 5 stars! My wife travels rather extensively in two states, mostly driving, and stays from two to five days. She would always need at least a second trip to the car to take into motels all she needed for the trip. In order to help her with this I decided to find a hand truck I call a dollyso she could make one easy trip. She loves this hand truck. It is light, strong, folds up and unfolds easily, and carries her lap top case, luggage, cooler, and occasionally a second smaller piece of luggage. The truck being quite small folded, she is able to keep it in her trunk, always handy for anything. And best of all, this made really big points for me. I am pleased with my purchase. It was delivered promptly. It was as described. It is meeting my needs. As a plein air painter, I must carry a load of gear. My Dr. said I could no longer use a backpack so I had to find an alternative. The handtruck, with a plastic crate works great. The wheels are large enough to make handling easyon all types of terrain. I use this cart to carry my equipment with. It works out great and it saves my back. I actually purchased this one for a friend of mine. These are great little carts. 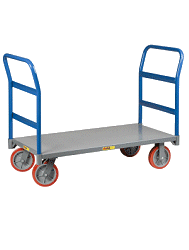 This cart is very sturdy and lightweight. Folds nice and compact. The little folding hand truck has been great for lugging my stuff in and out of venues where I've been vending. The only thing I dislike, and it's really not a big deal, is that there are several different bars at the top of the handle. One of them releases the telescoping feature of the handle, but it's exactly in the place where my hand seems to think it should go when I'm pulling the cart. So I keep accidentally collapsing the handle. But for the money, it's a great deal. Great first time experience with my order! Fast shipping and great service and the hand truck works perfect! The mailroom at our company purchased one of these carts for their employees. While on their mail rounds they brought the cart into our office. Our coworker noticed it and fell in love. She is moving back to England to live on a barge and could see multiple uses for it. She loved that it was lightweight, small and could easily fit on the barge without taking up lots of room. As her going away present our office staff purchased her the exact cart. She was overjoyed when we surprised her with it and was like a kid in a candy store. She kept folding it up and unfolding it and 'dancing' around the office with it. It was a very welcomed gift and will get a lot of use in England. Great cart! Could use a few more, stronger bungee cords with it. Works great for carrying my rifle and ammo bag to the range. I love my hand cart ! I have used it 4 times how and it has made transporting my dog gear from the car to the site a breeze !! I can load 2 large soft crates, 1 folding chair and my large gear bag with ease. I pull the hand cart with one hand while walking my dog with the other !! easy breezy !! with my handcart I can get it done in one trip !! I love my folding cart ! I bought it to carry my dog gear when I go to shows, I've used it 4 times now and it has made tranporting my gear from my car to the site a breeze !! I can load 2 soft crates, 1 folding chair and my gear bag, no problem !! I pull all that with one hand while walking my dog with the other, easy breezy !! Love it !! The hand cart works great..it even handled my two 6ft folding tables at the same time...I love how it folds up because I can slide it in just about anywhere. This is a great buy and a great light weight product. We wanted it for a fixture that we transport to our church every Sunday. We affixed it permanently to the fixture. It works very well. I'm thinking of getting another one for overseas traveling. Fast shipping, good product, works as advertised.